Sergeant Lowell Womack, left, is congratulated by Woodbury Police Chief Kevin Mooneyham following his promotion to the position of Assistant Police Chief Thursday morning. 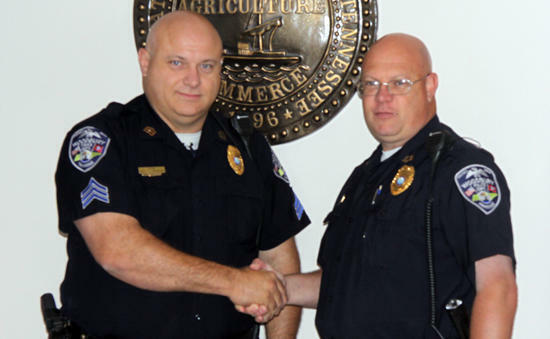 Woodbury Police Chief Kevin Mooneyham announced this morning that Sergeant Lowell Womack has been appointed to the position of Assistant Police Chief, effective Friday, July 13, 2012. In making the appointment, Chief Mooneyham stated that Sergeant Womack was first employed as a reserve officer by the WPD in 2007, which subsequently led to a full time position on 2008. Womack was then appointed to the position of Sergeant by former Chief Tony Burnett in 2011, and was responsible for the enforcement of city ordinances and codes. The new assistant chief said he looked forward to assuming the new role and additional responsibilities. Congratulations, Your appreciated for the considerate way you do your job. Congratulations to Assistant Chief Womack he is very professional and an asset to our city and county. Thank you for your service and dedication. Assistant Chief Womack is a great asset to the department and Cannon County is fortunate to have a person of this caliber in this position. Thank you for your hard work and dedication Lowell!!! Congratulations!! I know you will be a great asset to our community.